A conference of representatives from the Town Councils of Irvine, Troon, Kilwinning, Saltcoats and Ardrossan was held in the Masonic Buildings, Kilwinning, last night to consider the question of railway season ticket charges. Councillor Bogie, Saltcoats, presided and explained that at a former meeting they presented a memorial to the Caledonian and Glasgow and South-Western Railway Companies but had got no reply. After a discussion it was agreed to send as a deputation to the companies a representative from each burgh to urge the advisability of issuing cheaper season and monthly tickets and cheaper Saturday fares and interchangeable tickets. The new Busbie Muir Reservoir (shown below in 2006), constructed to provide an additional supply of water for the Burgh of Ardrossan, was formally opened yesterday by Provost Young. The ceremony was performed in a downpour of rain and only members of the Town Council and those directly interested in the works were present. After the ceremony, the contractor, Mr James Urquhart, presented a handsome silver fruit bowl to Provost Young as a souvenir of the occasion. 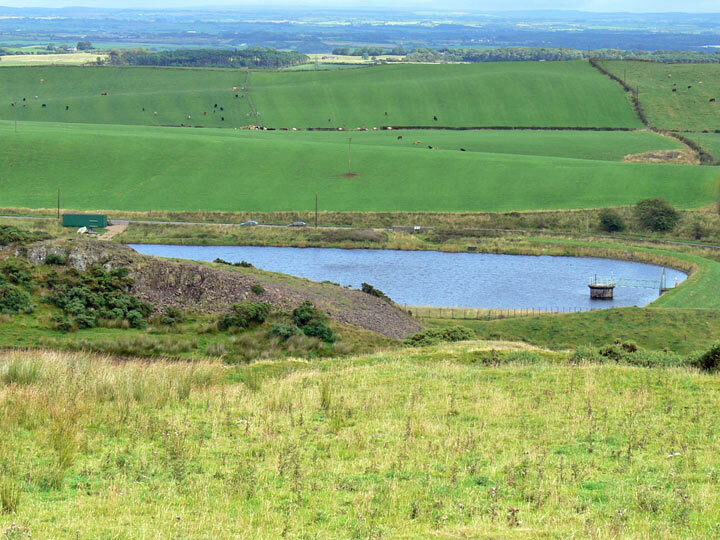 The reservoir, which cost upward of £15000 is calculated to hold between 70 and 80 million gallons of water. The engineer was Mr W R Copland, Glasgow. At the monthly meeting of Ardrossan Town Council, held last night, Provost Young intimated that he did not intend to seek re-election. He had taken a part in the management of the affairs of the town for a period of twenty-eight years, and for twelve years has had the post of Chief Magistrate. During his term of office important improvements have been carried out within the Burgh. He has taken a prominent part in providing for the drainage of the town, in securing a larger water supply and in the acquirement of new gasworks. It was owing to his personal effort that the streets within the burgh were adequately paved and he took the lead in many minor improvements. A majority of members of the School Board of Ardrossan has refused to carry out certain improvements in Ardrossan Academy, the only higher grade school in the district, and the Education Department has intimated that failure to comply with their demands will mean the reduction of the academy to the status of elementary school. It is the plea of those members who do not wish to accede to the request of the Department that the accommodation at the Academy is ample and that a rearrangement of classes is all that is required.